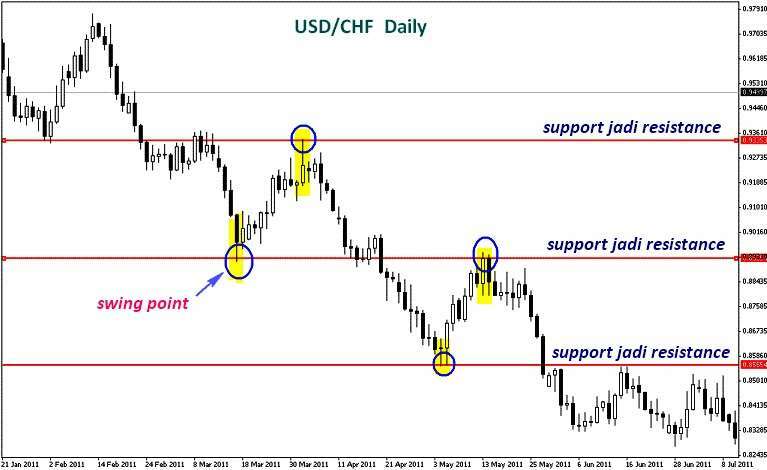 In trading forex, one strategy that is widely used is by utilizing Price Action. By knowing how to apply Price Action, traders can determine the right opportunity to open or close a position. But before you can implement it, of course you must know in advance what is called Price Action. 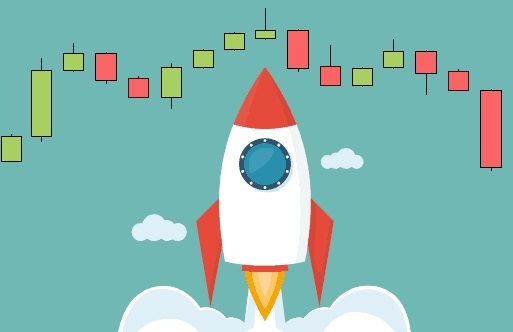 The definition of Price Action is the price movement of an asset or a currency pair, while the Price Action strategy focuses on analyzing price movements in the past, hoping to find patterns that can be learned to help take trading decisions in the future. There are so many methods that can be combined, but the most simple and effective Price Action trading strategies are those combined with Support or Resistance, both in the form of horizontal lines and Trendline. 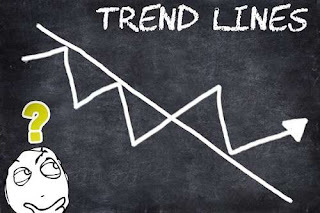 Horizontal lines and trend lines (Trendline) are often used by analysts to measure the strength of price movements. 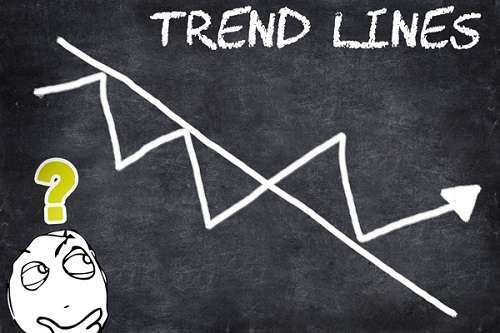 The boundaries around the Trendline line are commonly called Channels. 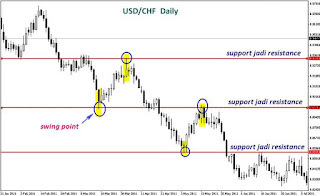 As shown in the picture above, USD / CHF moves Downtrend with Support and Resistance levels (in the form of horizontal lines) that follow the change rules: Support that has been broken will become a Resistance, while if the Resistance is broken, it will become Support .. Swing Point is a potential area for signal formation from Price Action. In this case, the formation of the Pin Bar formed on the Swing Point indicates a correction in the direction of the main trend (Downtrend). We can open or close a position manually on Swing Point after a trading signal has occurred. All Pin Bars in the example above experience rejection (False Break) at Support and Resistance levels, so that they can be considered valid. As for the Uptrend market, the process that happens is the opposite. In the example above, the 4 Pin Bars occur at Resistance and Support levels. For market conditions that are Sideways (Ranging), we can simply observe the formation of bars formed in Resistance and Support. If a break occurs, make sure it's not False Break. Why is the Pin Bar formation here important? Please note, forex traders often mistakenly think that all Pin Bars are formed for the same reason. In fact, many other factors influence the formation of the Pin Bar in addition to the size, characteristics, differences with the previous Pin Bar, as well as other technical factors. One of the things that needs to be observed is the moment when big traders take Take Profit action. For False Break conditions, we can open the position again after the bar has finished forming. Stop Loss level and profit target can be determined at a level close to the Support Resistance, according to the direction of the Entry position that we take. In horizontal market conditions such as the example above, the strength of the Support or Resistance line cannot show the length of the Sideways state. Basically, Sideways occur because the market is consolidating. The safe step that can be taken is to wait for the market to reach an agreement and determine its trend. On the USD / CAD Daily chart image above, there appears an Inside Bar Setup on the horizontal line Event Area (in this case the Support line) before being broken and turned into a Resistance. 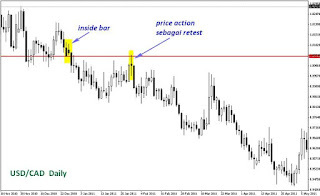 Next, a setup Price Action Pin Bar is formed which has a rejection (False Break) on the Event Area of ​​the line, as a Re-test that shows the strength of the trend. From the 3 examples above, it can be concluded that the application of the Price Action strategy will be more effective if it is combined with supporting factors, in this case horizontal support or resistance lines. However, there are more ways to implement Price Action that are recommended if the price experiences a Reversal, which is a confirmation with the Supply And Demand area. This reversal is not the same as a reversal in the range that occurs in Sideways market conditions above, because prices can form a new trend very strongly after hitting an important level. Predict when Reversal will occur is the target of many Price Action traders. Unfortunately, there are not many ways to really predict when Reversal will occur, especially if it is only based on current price conditions. 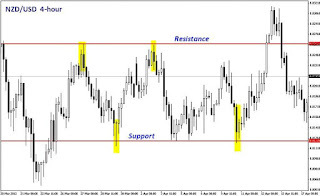 Most traders predict Reversal moments from prices taken from the past, by using the Support And Resistance method, or if you want to be more measurable, traders can use the Supply And Demand area. The most common way to detect it is to look at certain candlestick patterns that are formed within the important supply or demand zone. For example, if you see a price going up to the Supply area with sharp movements, followed by a Price Action signal like a Bearish Engulfing pattern, that is a sign that Reversal will occur. To find out how to implement Price Action effectively, traders need to learn Support Resistance and candlestick formations first. Furthermore, traders can analyze how price movements at the point of Support and Resistance or Supply And Demand, in accordance with ongoing market conditions. With lots of practice, traders will be able to tell which movements are confirmed, and which ones are false movements.